Personality: The Dorkie has very sweet disposition. Temperament: The Dorkie is a very happy dog who loves to give kisses and play. They also love to be a lap dog. Family Dog: The Dorkie is a great family dog who loves kids and other pets. Barking: The Dorkie has short, sharp barks. Appearance: The Dorkie can have the Dapple coat like the Dachshund but longer like the Yorkie. They may possibly inherit two different color eyes a trait of the Dachshund. Eyes: The Dorkie may have one blue eye inherited from the Dachshund parent. Ears: The ears of the Dorkie can be floppy like the Dachshund's or stand erect like the Yorkie's with fringing. Body: The body of the Dorkie is smaller in size but longer like Dachshund. Feet: The Dorkie may have a slight paddle foot which is good for digging out rabbits. Tail: The tail of the Dorkie can be left natural and is usually wagging. 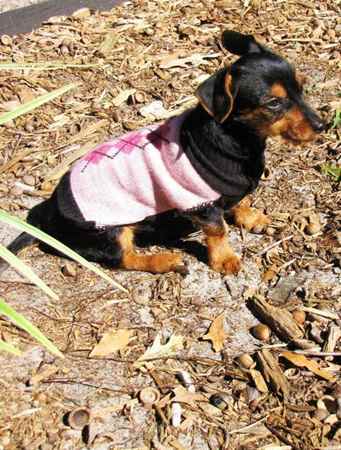 Color: The coat of the Dachshund can be dapple, black & tan or gold & black in color. Coat: The coat of the Dorkie is very soft with light wispy hairs. Allergies: The Dorkie may have skin allergies. Skin Health: The Dorkie may have mild flaking of the skin as a pup.